Lose your fears and build your wealth in today’s fast-changing real estate market, guided by experts who walk their talk every step of the way. If you are serious about real estate investing, you cannot afford to miss the strategies taught in this rare program. Tested and proven in deal after deal, these are the principles that brought wealth and success to the presenters. Now they can bring the same results to you, too. If you listen to the pundits, you must be waiting for the real estate market to come crashing down. Talk of a real estate bubble has scared investors and homeowners alike. Now masters of real estate investing take on the bubble babble and puncture the myths that have spread through the media. Every market, including real estate, has its cycles. The question is, do you have an investment strategy that is prepared for downturns as well as upturns? These wealthy and successful investors all arrive at the same fundamental principles. They show you how you can safely invest in real estate and build your wealth at any point in the market cycle. 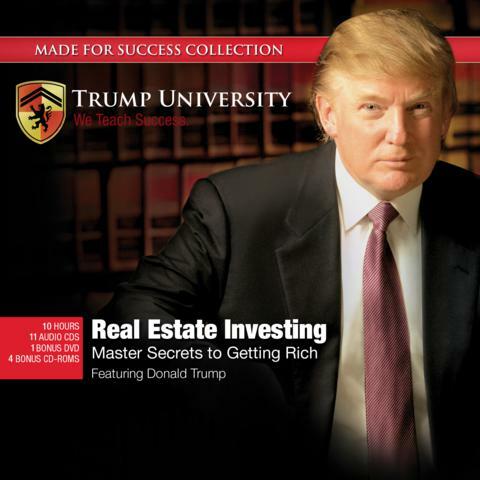 DONALD TRUMP, founder and chairman of Trump University, is the most successful real estate developer in the United States, and a dominant figure in the business world. As best selling author of seven books and star of The Apprentice television series, The Donald serves as a mentor and inspiration to millions of people worldwide.